This was originally published on Monday, November 2, 2015, in the Pacific Daily News. Click here to subscribe to the PDN. Q: My husband and I just got married three months ago. We are still trying to consolidate our two households into one. What financial tips do you have for newlyweds? Congratulations on your new life together! There are a lot of adjustments that are going to take place and one of them is your finances. Finances are never an easy topic to discuss, because it is a very personal topic. While it may not be easy, it is a conversation that needs to be discussed. It is imperative that you and your husband are on the same page with spending and saving money. Be open and honest with each other about your financial situation. The goal is to come to an agreement about how your household finances will be managed. Gather your important financial documents such as insurance, retirement plans, wills, bank and credit card statements, loans, monthly bills, and any other documents that affect your financial health. Get a copy of your credit scores as well. Knowing what your score is will help you plan your household’s financial goals. Talk. This is your opportunity to learn about your spouse’s past and present money habits. Discuss how your family talked about money as you were growing up. Were they open about the family finances or was it secretive? Were they big spenders or frugal? Did they fight about money? Most of us learn how we deal with finances from our parents and each one of us deals with money differently. Also, discuss your current money habits. How much, if any, do you save? Do you live paycheck to paycheck? What do you consider a luxury item? Goals. Much of what you and your spouse want to achieve will probably revolve around money. Whether it is going on vacation, purchasing a car, going back to school, saving to purchase a house or retiring. Set up financial goals you want to achieve within a year, five years and 10 years. After deciding what goals you want to achieve, agree on how much to invest. You will need to work together to figure out how much you can afford without stretching your finances too thin. For short-term goals, think about using bonds, certificate deposits (CDs) or a money market fund. Think about using a mix of stock and bonds that provide a higher rate of return based on your risk management. The younger you are, the more likely you can tolerate more risk since it gives you an opportunity to gain more money in case your portfolio loses money. Don’t put all of your money in retirement accounts because there are penalties for early withdrawal. You may need to consult a financial adviser to help you maximize your investments and savings. It can be difficult to determine how much money will be allocated to achieve your goals. If both of you have investments, ask your adviser to look for areas where there is overlap. You want to be certain that your money is working efficiently. Review your goals yearly to monitor how your goals are being achieved. Another financial goal is to start an emergency fund. Most experts feel that three months of income is an optimal amount of money to put aside. To help you achieve this goal, use an automatic deduction into your savings account. That way, you don’t have to remember to put money aside or be tempted to spend it. Joint or individual. Will you have a joint account or separate accounts or maybe a combination of both? This is a personal choice and what works for one couple does not necessarily work for another. Many couples use a joint account to pay household expenses that they share and use individual accounts for their personal use. Individual accounts are best when there are different spending habits. If using a joint account, decide how much each of you will contribute. There is no right or wrong amount but what is sensible in your marriage. A shared account requires spouses to communicate and not keep secrets from each other. When filing taxes, you may want to visit an accountant and talk about filing joint or individual. There are certain advantages and disadvantages for both. Having a professional evaluate your situation will certainly clear things up. This was originally published on Monday, April 22, 2013, in the Pacific Daily News. Click here to subscribe to the PDN. Suze Orman once said “a big part of financial freedom is having your heart and mind free from worry about the what-ifs of life.” That is undoubtedly the mindset you want when it comes to planning for your retirement. Unfortunately for many people, retirement planning causes anxiety, especially when faced with numerous financial uncertainties. Whether retirement is just around the corner or thirty years away, there are several steps to planning for a successful retirement. •Have a goal — I discussed this a few weeks ago. But I feel it is worth repeating. It is essential to know how much you need to live comfortably during your golden years. Having a set goal will ultimately line up how much you need to put away yearly till that day of retirement. It is uncertain how long you will live after you retire but consider having enough put away for twenty to twenty-five years after retirement. •The sooner, the better — Start a plan as soon as you can. It is never too late. Even if you have ten years or less till retirement, you can start saving. You may have to work a little harder to catch up, but having something put aside is better than not having anything at all. •Keep track of your progress — Once you have your target goal and your money is working for you, watch your progress. Review your investment portfolio yearly. If your investments perform better than expected, you may want to consider a less aggressive strategy and lower the risk level needed to make your goal. And vice versa, if your investments are not performing to meet your goals, you may need to invest in a higher level of risk. As time goes along and your lifestyle changes (marriage, family, homeownership, etc. ), you may need to readjust your goals or contributions. •Stay invested — Many retirement plans are based on the stock market. It is very difficult to watch the market rise and fall. Don’t give into the temptation of moving your investments around. Ride it out for a while. Stocks generally are considered a long-term investment. The ups and downs usually average out and provide a steady return on investment when you invest long term. •Work with a professional — Planning for the future is very important and can be quite confusing. You may want to hire someone who can help you grow your nest egg. Look for someone who has your best interest in mind. They should have access to a wide variety of investment options from different companies. They should not represent any specific investment company. Their fee should be based on how your portfolio performs. If they ask for their fee up front, there is no incentive to make your money grow. Michael Camacho is president and chief executive officer of Personal Finance Center. He has more than 20 years of experience in retail banking and with financial institutions in Guam and Hawaii. 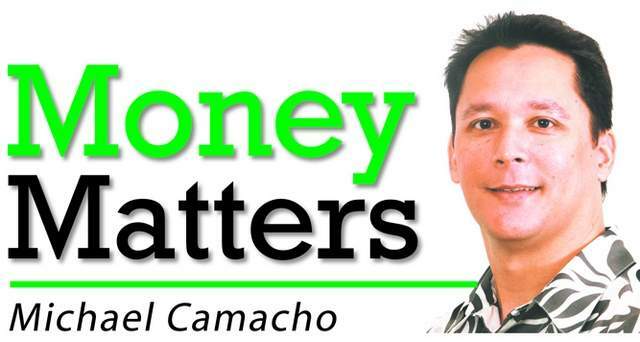 If there is a topic you’d like Michael to cover, please email him at moneymattersguam@yahoo.com and read past columns at the Money Matters blog at www.moneymattersguam.wordpress.com. Merry Christmas Eve! Tomorrow, we’ll see the wishes of our children, family, and friends fulfilled as gifts are opened on Christmas Day. In the next few weeks, you can start thinking of your own wish list for the upcoming year, as well as for your long-term future. We’re nearing the end of this series of tips for your annual financial review, and now it’s time to take what you’ve learned and use it to create goals for the future. Throughout your financial review, you’ve had the opportunity to set upcoming goals related to debt and retirement, which you can now include on a list of your overall financial goals for 2013. You also have some tools to guide you in creating your 2013 goals. In last week’s column, we discussed reviewing last year’s savings goals. You considered the strategies that worked and the goals you did and did not meet, and you can use this as a leaping off point for a new set of 2013 goals. Last week included a review of your net worth, which you can now use to create or change short-term and long-term goals. How do you want the figures for your assets and liabilities to change within the next year, and the next twenty years? What can you see for yourself and your family? Take notes on the ideas you have from reviewing these lists, and if you share finances with a spouse or a partner, take the time to discuss each goal. As you make each goal more specific, you’ll also begin thinking about how to manage and reach goals with your current and future resources. Your discussions and notes will also help you prioritize goals for 2013 and the years ahead. A year is a long period of time, and the new experiences you’ve had and the people you’ve met in 2012 can influence your thinking about new goals, or even change your financial direction. You may also have experienced changes in your family or circumstances that result in new goals for you. The end of the year is a good time to think back on those experiences and changes, and to write down new goals or ideas that you have been considering. You can discuss these ideas with your family and friends, so that you have multiple perspectives available to you. In previous columns, we’ve talked about create a timeline that helps you map out your specific financial goals, which are marked at specific dates of completion. This can help you decide whether or not your goals are realistic, given the time and the resources you have to complete them. A realistic view will give you more motivation to prioritize, and focus on the goals you truly need and want to meet. This timeline, or multiple timelines, should be a part of your annual financial review. You can choose any span of time that is helpful to you, from a short-term timeline of five years to a 30- or 40-year timeline. Now that you have a complete list of goals and a timeline to help you prioritize, mark out the goals that you intend to pursue in the upcoming year. We’ll use this goal list next week, in revising your monthly budget for 2013.